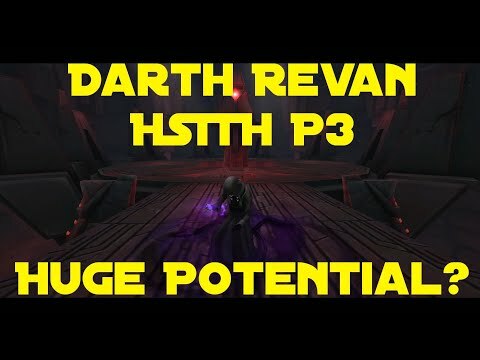 Anyone try out Darth Revan team in HSTR?! Let’s see who can deal out the most damage. I wonder which part of the raid does it look like he’ll dominate. Post your HSTR damage screenshots! The constant tenacity up with attacks will curtail debuffs although the potency can stack rather high with Ferocity. Probably usefull on phases 2 since Sion is pretty simple and phase 3 by destroying the lighsabers fast. Only p3 would be effective imo. Triple deathmark and add rolo as 5th. Should be ok. Otherwise, no matter how much speed stacks, the bosses will gain more to compensate wherever they get poked. Also the defense loss will not be good for their survivability. Has anyone tried him in P3 yet? It seems like it might be difficult to topple Traya, since she’ll be hit by deathmark as soon as you kill one saber. didnt know what I was doing, only pushing the buttons in the lower right. sithtrooper was a fail, marauder might work better. I've had some success in phase 3, with sub g12 half the squad & doing close to 5m damage. D.Revan, Bastila, HK, Maurauder, Palp (last one should be assassin but don't have him farmed yet) - sith trooper is trash. The aim is, to drop one saber (unload full turns with deathmark) - next saber - repeat, then topple her with deathmark on. Load up as many debuffs as possible, then use HK-AOE attack to proc death-mark many many times. 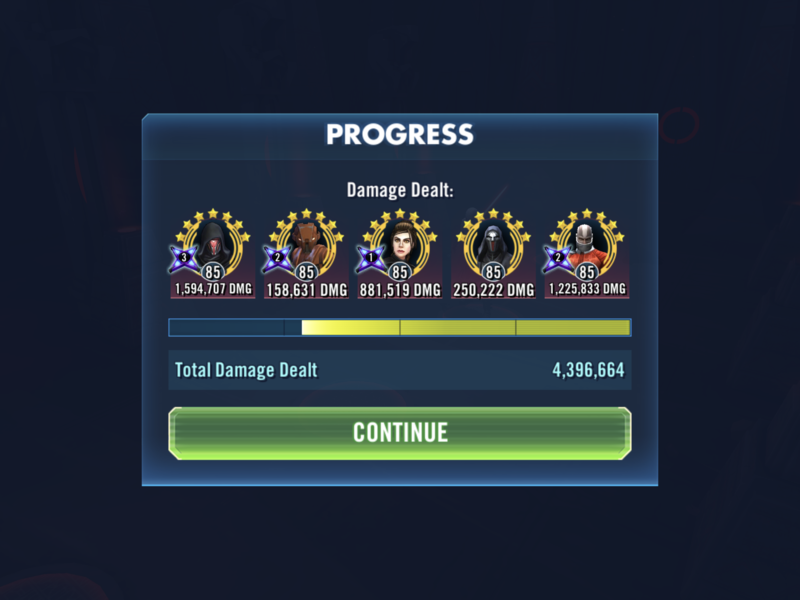 Using this I reckon a full G12 god-modded squad could push well over 7.5m+ on sith raid phase 3. This is p2. As you can see marauder and hk died really quick so I’m not sure what to do about that. Assassin may be better for pure survivability but I don’t have her geared. I'm getting 5M with Revan, HK, Bastila, Maurader, Trooper in p3. Unfortunately my Malak won't be 7* until after tonight's Sith Raid, so I'll have to wait a few days before I can start testing him there. Skelturix just posted a video where he gets 15M with DR, DM, SA, SM and BSF in p1-p2 of HSTR. That’s kind of a clone of JKR then because his team does 15M+ damage in P1-P2 of HSTR. Those bridging videos are meaningless to me, because it's almost impossible to get the last 10% of p1 in my guild. p1 usually lasts less than 15 minutes, and can often jump from 50% to p2 in an instant if several players post their damage in rapid succession. So as impressive as those big numbers are, I need to look at places where Darth Revan can score a bigger number that Jedi Revan - or a place where he can score higher than the other squad(s) I use. Right now my RJT squad can score more than Darth Revan, and Jedi Revan can do more in p2. So...neither of those is a good option for me. Lots of options. You can use dr in p3 for 5m+. You can use dr in p2 then use JKR in p3. Yes, but I think Jedi Revan usually only gets 5-8M in p3 (depending on how early Isolate hits), so the score should be higher with him in p2. Isolate does almost nothing to a Darth Revan squad in p3, so I like not having to worry about what Isolate's CD is at. I got 5.4M with last night's raid, and that brought my Malak up to 7*. So, I'll see what damage I can do in p3 with Malak instead of Sith Trooper! I need to look at places where Darth Revan can score a bigger number that Jedi Revan - or a place where he can score higher than the other squad(s) I use. Right now my RJT squad can score more than Darth Revan, and Jedi Revan can do more in p2. So...neither of those is a good option for me. DR team just not designed to be high scorer in raids. Teams that holds high numbers there built around some sort of TM train. DR team don't have any. P3 is probably the place where you can squeeze more damage than other phases but NS or CLS is obviously much better choice. I don't understand why you need DR at all. I use the Ventress phase 4 Nightsister squad, so NS isn't an option in phase 3. I use CLS in Chewie Chex Mix first in p3, then the ROLO squad, followed by Darth Revan. If there's enough time, I have started running my Boba/Wampa squad in p3 (because I usually don't have time in p2 to run it). Ideally I can pick up the last 2-4% of phase 3 to roll NS into p4, and get a solid 8-10M points from Ventress. I am not willing to run the CLS/C3PO p3 solo squad, because it sounds terribly grindy and manual, and I don't need more work in this game. I'm already looking for ways to make my raids easier. Plus, if I do this, then I miss out on 11-15M in phase 1. My guild normally takes about 12-15 minutes for p1, 10 minutes for p2, and maybe 20 minutes for p3 (depending on the day of the week and how many are playing). P4 takes the longest, because the good NS runs usually take 20-30 minutes of play before they post, and then all of a sudden it goes from full p4 to Traya, and we just grind her out quickly. Running Darth Revan in p3 does 2 things: It adds ~5M to my score in just few minutes worth of play. And it's fun to experiment with the new team, especially since so few players seem to be experimenting with Darth Revan in p3.